Pieve di Cadore’ is a pretty little town huddled in the folds of the Dolomites just an hour and a half away from Venice and less than forty minutes away from Belluno. 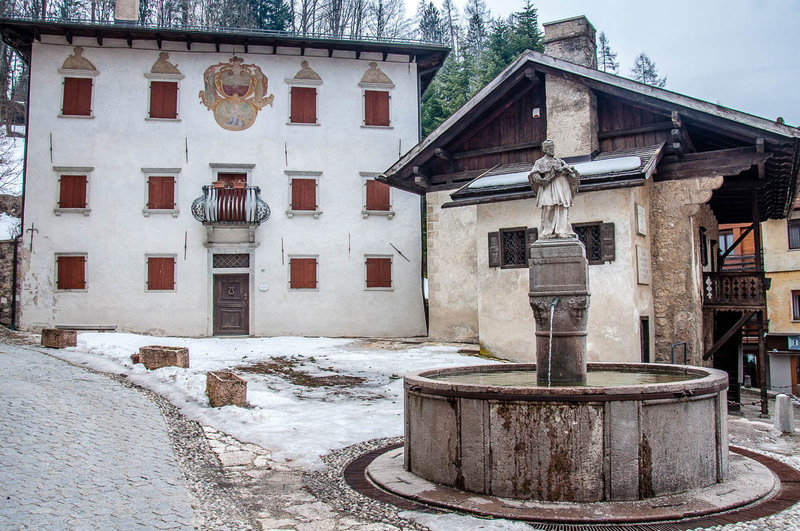 Famous for being the birthplace of Titian – the leading Venetian artist of the Italian Renaissance – Pieve di Cadore’ is also the cradle of the Italian optical industry. 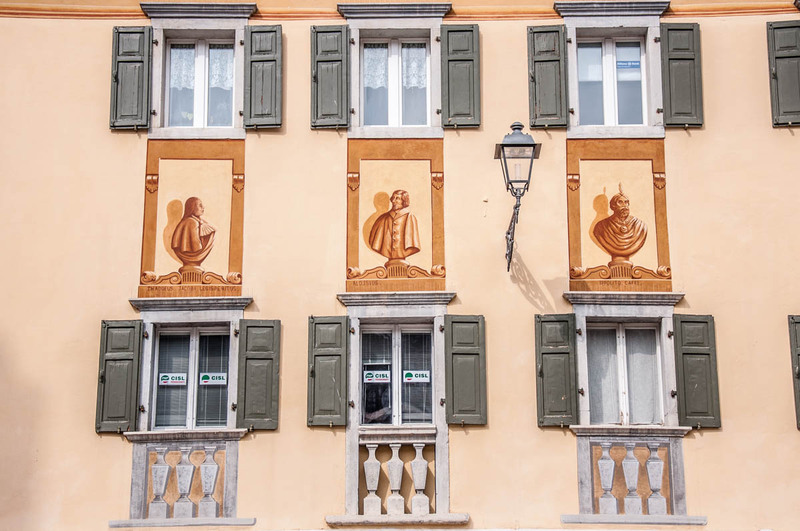 Although small in size, the town has a lot to offer in terms of sights and it’s a beautiful day trip during your exploration of the Northern Italian region of the Veneto. 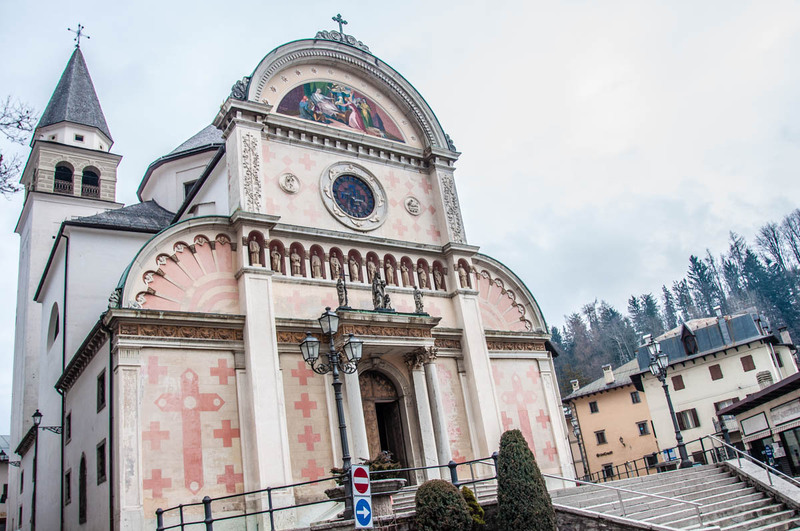 If you love art, nature and… ahem… eyeglasses, Pieve di Cadore’ is a great destination to head to and today I am going to tell you in detail about the six main things you can see and do there. 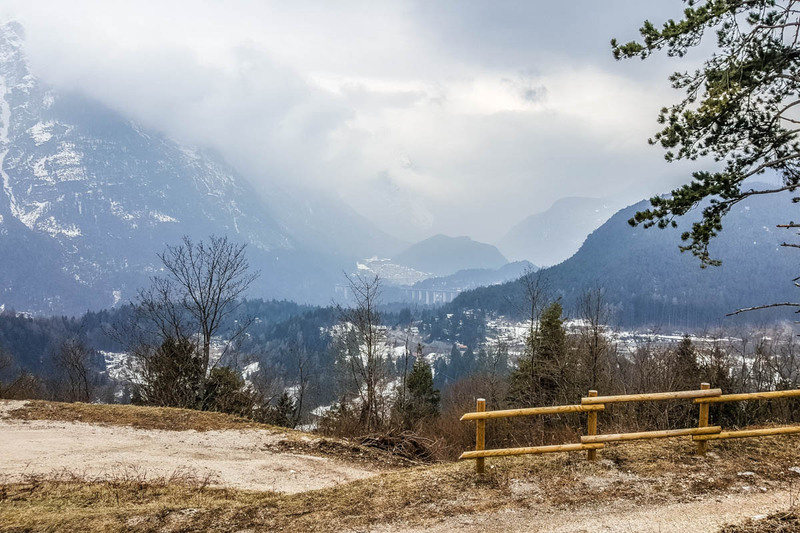 We visited Pieve di Cadore’ on a snowy day in March this year. The drive from Belluno was beautiful with the road curving through mountainous landscapes dotted with hamlets and houses. Suddenly, the road went up and up and we passed by what potentially could be the playground with the most striking view in the world. Perched on the top of a hill and surrounded by sturdy wooden railings, the swings and slides overlooked Lake Cadore’ huddled at the bottom of a picturesque valley. As it was rather cold, we continued straight ahead to Pieve di Cadore’ but it must be so nice being a child growing with those soul-inspiring views. 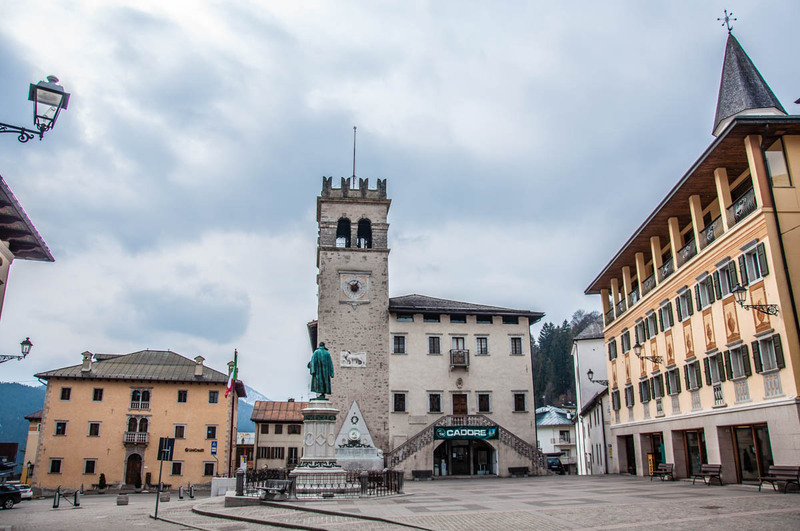 Soon, we were driving past Pieve di Cadore’s main square – Piazza Tiziano. At its wider end stood an imposing statue of the town’s most famous son – Tiziano Vecellio in Italian or simply Titian in English. 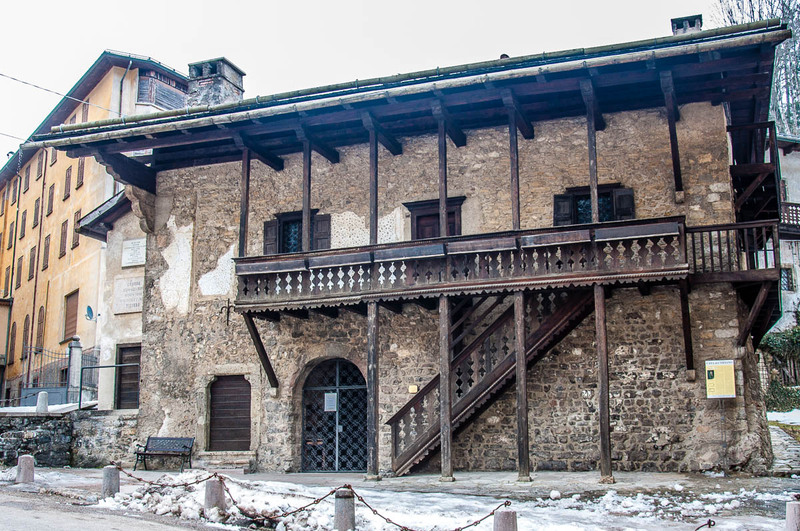 The road sloped down past a centuries-old wooden house with a pretty veranda – Titian’s birth house. This was soon followed by a modern glass building – the Optical and Eyewear Museum. A large parking lot just opposite the museum was the perfect place to park. Above us, we could see the beautiful facade of the Church of Santa Maria Nascente and the tall houses in Pieve di Cadore’s historical centre. Once we left the car’s warm interior, the cold air of the Dolomites felt fresh and energising on our cheeks and our exploration of Pieve di Cadore’ started in earnest. Here is what to do and see there in a day or, if you are a speedy sightseer, in half a day even. I have included lots of details for each sight on the list below. The many photos will give you a good visual idea as to what to expect. 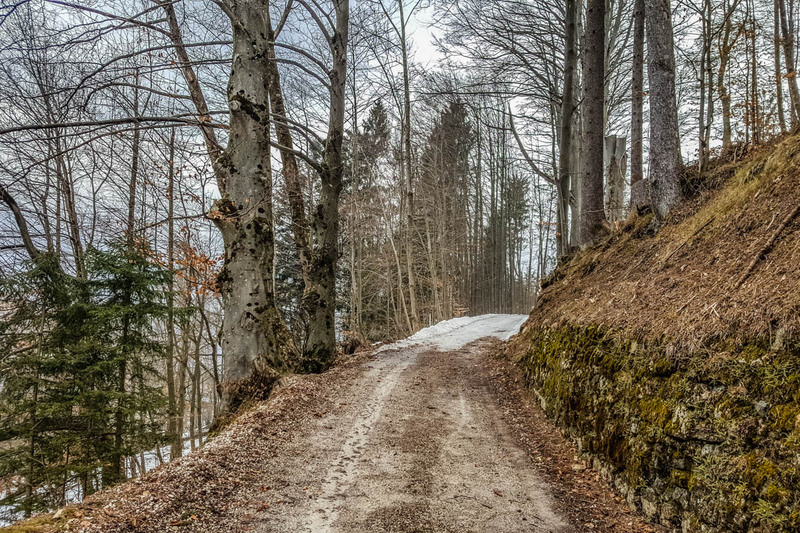 Right at the end, you will also find a short list with some practical tips to make your visit to Pieve di Cadore’ as pleasant and streamlined as possible. The house in which Titian was born is, undoubtedly, Pieve di Cadore’s major sight. 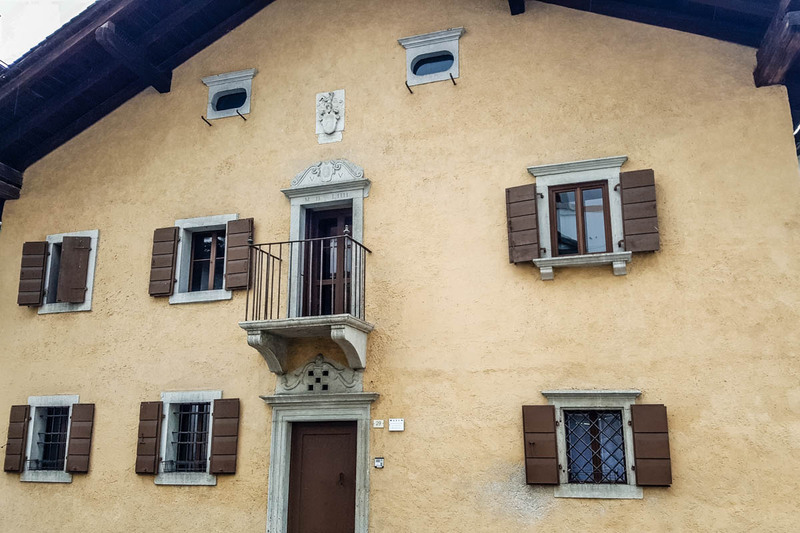 Titian – the most important representative of the 16th-century Venetian art and a pillar of the Italian Renaissance – was born somewhere either between 1480-1485 or between 1488-1490 in this lovely rustic house which is just a few steps away from the town’s central square. many of the most important sights in Venice, like the Doge’s Palace, the Biblioteca Marciana and Gallerie dell’Accademia. 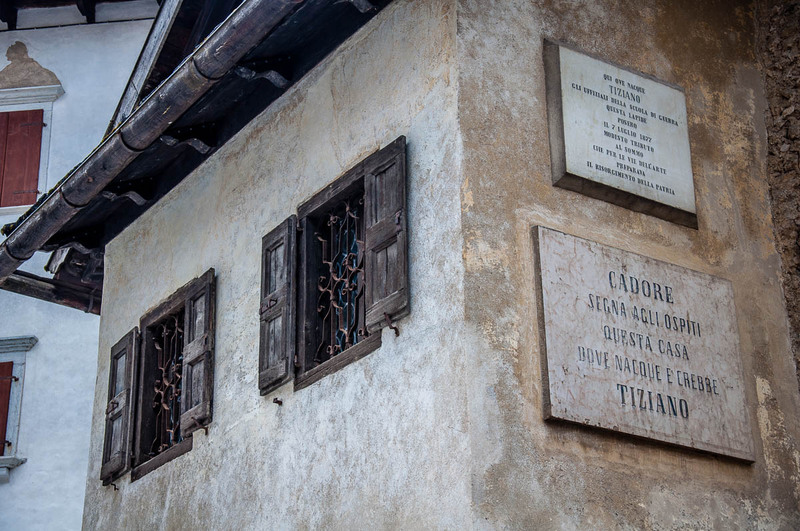 Well, it all started here in Pieve di Cadore’ where Titian was born in a distinguished family. His grandfather was a notary and his father was the superintendent of the local castle, a councillor, soldier and manager of mines. Titian spent the first nine years of his life in Pieve di Cadore’ before heading to Venice to train as a painter and excel as an artist. He returned several times to his hometown in the course of his life. 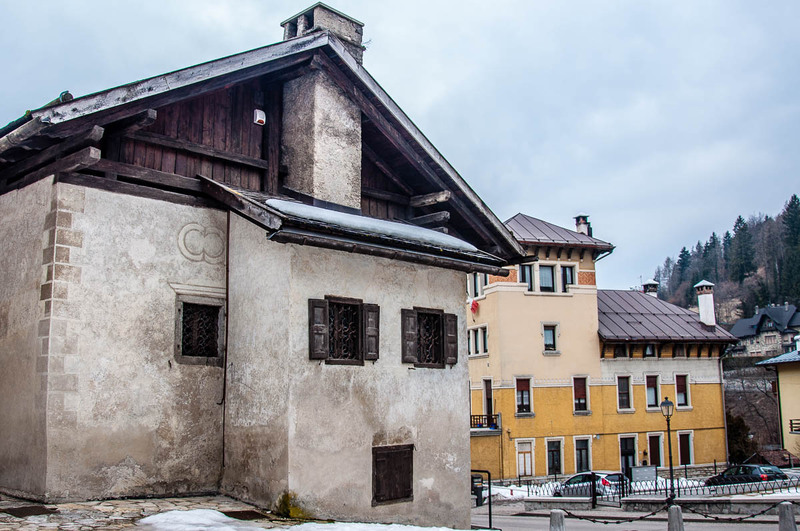 Titian’s birth house is a traditional house in the Cadore’s style. Built in the 15th century, it has been renovated several times since then, yet it feels very authentic and it is lovely to look at. In the 18th century, the house was enlarged in such a way that the new build hid the ancient facade. This was rectified in 1928-1930 when the original look of the house was restored. You will notice that the windows and the doors seem tiny – a feature typical for the period when the house was first built. There are two floors connected by an outside wooden staircase which leads up to a nice veranda. On the ground floor, you will find a large lounge with a wooden floor. There you’ll see copies of Titian’s drawings, the originals of which are kept at the Uffizi Gallery in Florence. There are also copies of letters signed by the renowned artist. On the upper floor, there are five more rooms and a kitchen with a traditional hearth. In fact, the kitchen was the only heated place in the house and you can imagine how cold it must have been living there considering the freezing winters of the Dolomites. Still, having a heated room at the time, albeit just one, was a sign that Titian’s family was quite well-to-do. The house functions as a museum and temporary exhibitions are held in it. Be aware that the opening hours are split by the traditional Italian long lunch break, called riposo. Also, from the 15th October to the 1st May, you need to call or email in advance to book your visit so that someone is at the house to let you in. We were told that this is because the house does not have heating and it is difficult for someone to be there at all times when it is really cold outside. 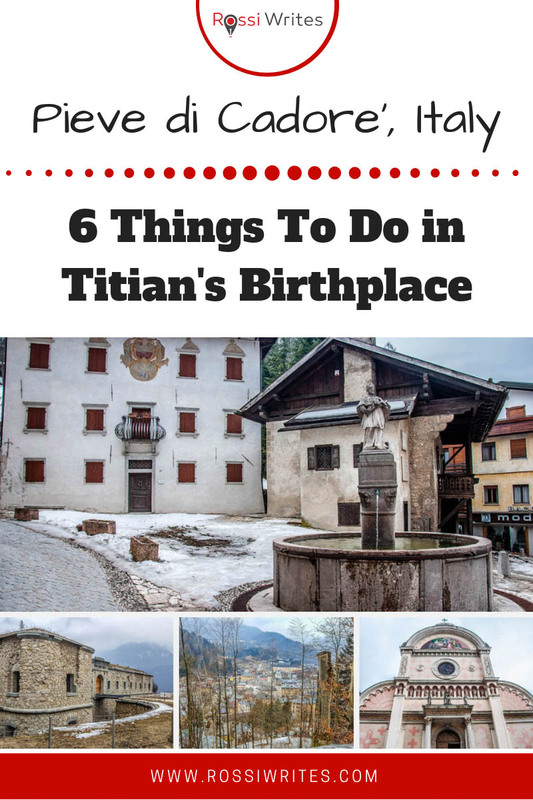 You will find Titian’s birth house on Via Arsenale, 4 in Pieve di Cadore. It is just a few steps away from the main square – Piazza Tiziano. For further details and contact number/email, visit the official website here. The Church of Santa Maria Nascente has one of the most striking facades I have ever seen. Seemingly an elegant mixture of late Gothic and early Renaissance styles, its shape reminds me very much of the facade of the Church of San Zaccaria in Venice. 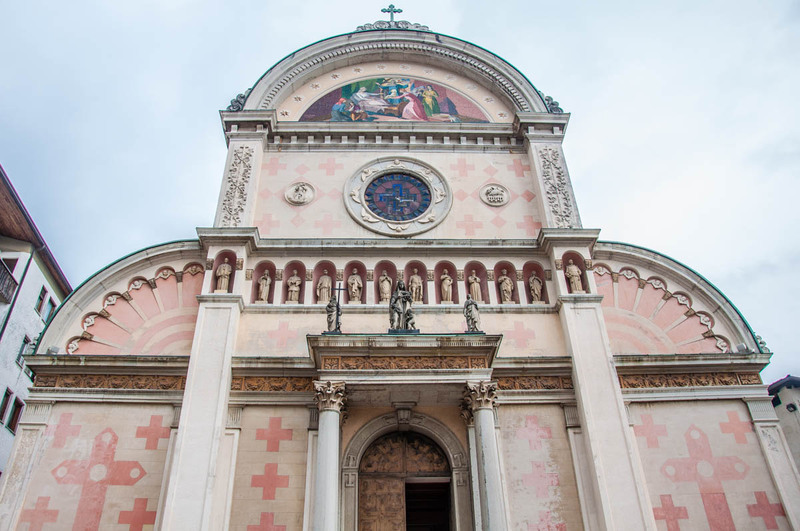 Yet, unlike the restrained white face of the Venetian church, the facade of the one in Pieve di Cadore’ is beautifully decorated with pink crosses and a statuary which draws the eyes upwards. 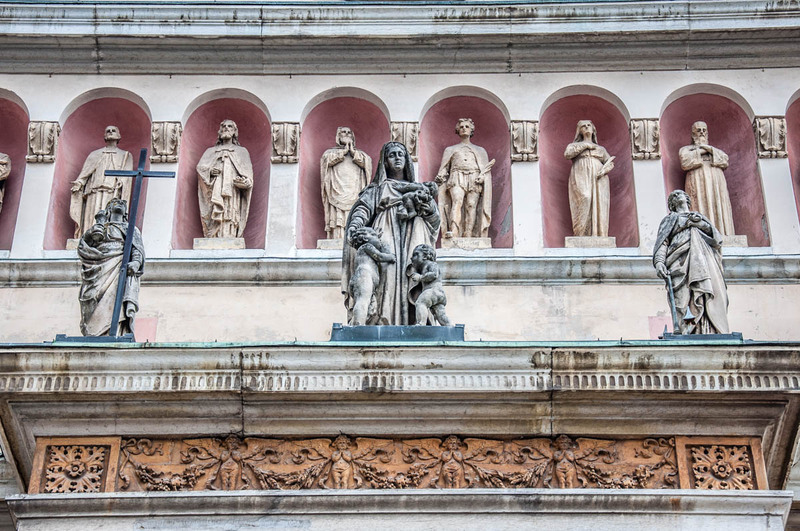 In the central lunette at the top of the facade, there is a beautiful mosaic depicting the Nativity of Mary. The current structure of the Church of Santa Maria Nascente in Pieve di Cadore’ dates back to 1763. A church had stood at that same place as early as the 11th century. It was remodelled and extended several times since then. The church which preceded the current one, actually, had frescoes by Titians and his students. a painting by Gaspare Diziani – a painter from the Veneto and contemporary of Giambatista Tiepolo. The church is really lovely inside and it was really nice spending time there looking at all the pieces of art. We were the only people in at the time and it all felt very peaceful and unrushed. In order to see the paintings well, drop a coin in the box by the side entrance. This will activate the spotlights and you will be able to see and appreciate the painted figures so much better. You will find the Church of Santa Maria Nascente on Piazza Tiziano in Pieve di Cadore. The church is very easy to locate and visit as it is right in the heart of the town. It’s interesting to note that Pieve di Cadore’ is the birthplace not just of Titian but also of Italy’s optical industry. 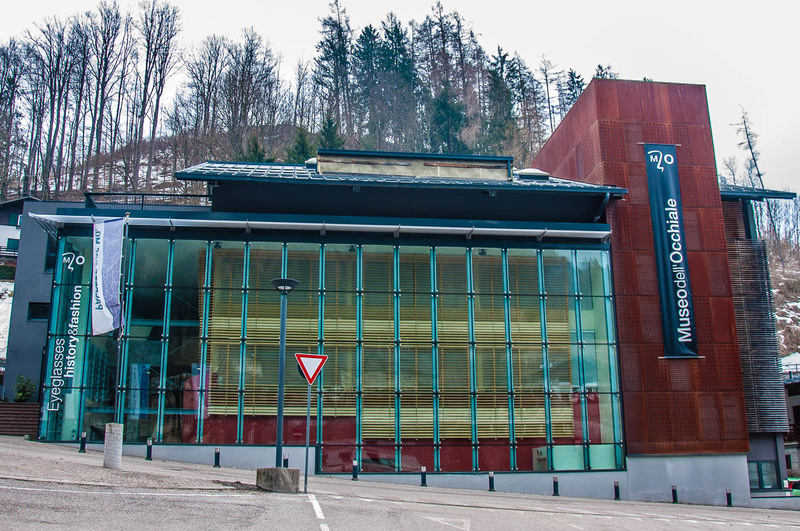 The very modern and interesting to explore Optical and Eyewear Museum in Pieve di Cadore’ tells the story of eye lenses, eyeglasses and sunglasses from ancient times to the present day. There are over 4000 exhibits and the more you see the more amazed you are by the incredibly interesting and complex story of optics and glasses. 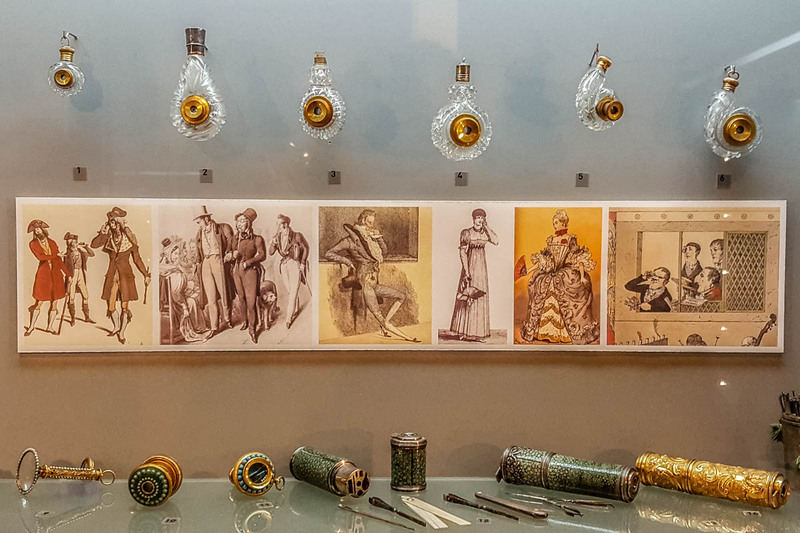 On the first floor, there are many historical artefacts and a rich collection of glasses and eyewear – from spy glasses attached to the end of fancy walking sticks to the trendy centuries-ago pince-nez. 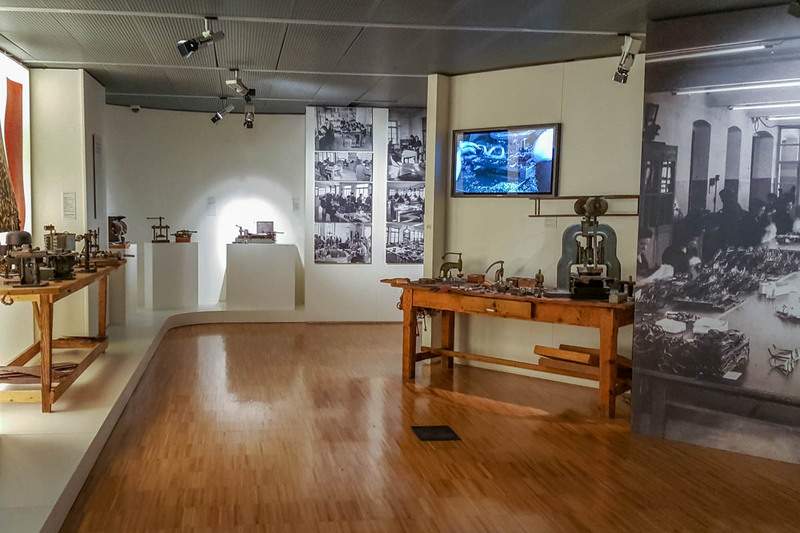 On the second floor, you can learn the story of the optical industry in the Dolomites. They have recreated artisan and factory workshops equipped with historical optical tools and machinery. We loved spending time exploring the museum. There is lots to see and learn there. Through the year the museum also organises many thematic events. For parents of small children wondering if they should visit the museum, it’s good to note that there is a small table equipped with toys, colouring pencils and books so that their little ones can play a bit (adult supervision is compulsory). This worked very well for my husband and I as we took turns to explore the museum while our little daughter occupied herself at the kids’ table. 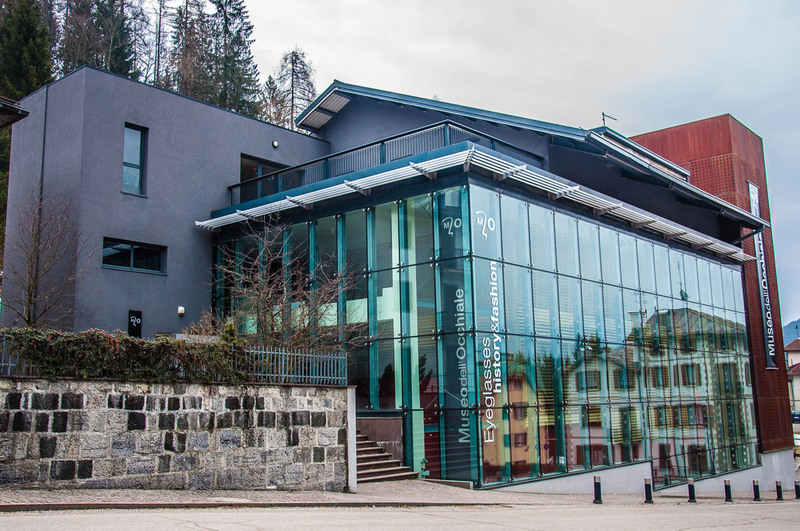 You will find the Optical and Eyewear Museum on Via Arsenale 15 in Pieve di Cadore’. It’s just a few steps further down the street from Titian’s birth house. For further details and contact number/email, visit the official website here. Pieve di Cadore’ is surrounded by beautiful nature and striking mountain peaks which Titian recreated many times in his paintings. If you love hikes and walks, you will be in heaven as the surrounding area is dotted with some great trails. For a quick and pleasant hike, head up to the Monte Ricco Fort – a place on top of Mount Ricco which has served a defensive function since Pre-Roman times. In the Early Middle Ages, a castle was built there (in fact, later on, Titian’s father was the castle’s superintendent). Its tower is one of the two towers which to this day feature in the coat of arms of Pieve di Cadore’. From 1420 onwards, a Captain, appointed by the Republic of Venice, resided in the castle and governed the area in line with the Venetian politics. At the end of the 17th century and the beginning of the 18th century, the castle was abandoned to the point that for a while it served as a source of building materials for the extension of the Church of Santa Maria Nascente. After Italy’s Unification, two fortifications were built above Pieve di Cadore’ to serve as a defensive spot against the Austro-Hungarian army. One was called Batteria Castello and the other Forte Monte Ricco. The Monte Ricco Fort was erected at a height of 953 m and almost at the same site at which the old castle had once stood. Both forts were blown up in 1918 by the Austrian army. 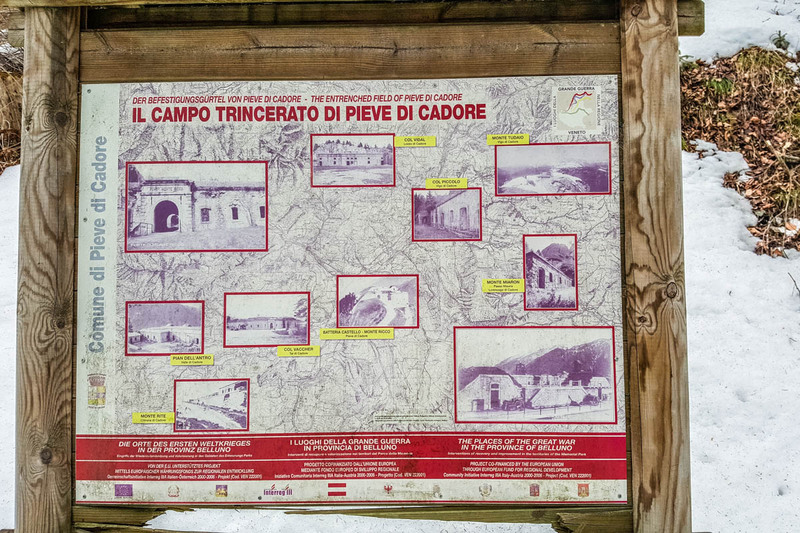 On the above map, you can see the trenches that were built in the area of Pieve di Cadore’ as well as the Monte Ricco Fort and other nearby forts. Nowadays they are the main points of reference with regards to the events of World War I in this corner of Northern Italy. The Monte Ricco Fort underwent a ten-year long restoration between 2007 and 2017. It is now used as an exhibition space among other things. The Monte Ricco Fort can be reached only on foot. The path starts behind the Optical and Eyewear Museum and it is wide and easy to follow. The first part of it is tarmacked. The path curves a few times going up the hill. The inclination is easy to negotiate, yet it’s advised to wear comfortable shoes and clothes. Depending on your speed, it can take as little as ten-fifteen minutes to reach the fort on top of the hill. As there was quite a lot of snow on the path when we were there, it took us longer than that. We also stopped quite a few times along the way to look around and to admire the views over Pieve di Cadore’. Be aware that the Monte Ricco Fort has some very restricted opening hours and it is closed from November to May (when it can only be visited as part of a group and upon booking in advance). Even when the fort is closed (as it happened to us), the hike up to it is worth it, so give it a try. For further details and contact number/email, visit the official website here. Don’t miss this small but very neat Archaeological Museum which explores the story of Pieve di Cadore’ and its adjacent area from Pre-Roman times onwards. You will find the museum housed in the Historical Palace of Pieve di Cadore’. The building has had a rather tumultuous history. Originally built between 1444 and 1492, it was sacked and burned in 1511 during the War of the League of Cambrai. An effort was made to restore the castle but a big fire in 1588 destroyed it completely. The palace was then rebuilt and to this day it takes a pride of place on Piazza Tiziano in town. It is curious to note that the palace’s ground floor was used as a prison at the end of the 17th century. The former prison rooms have nowadays been transformed into the large Cafe Tiziano. 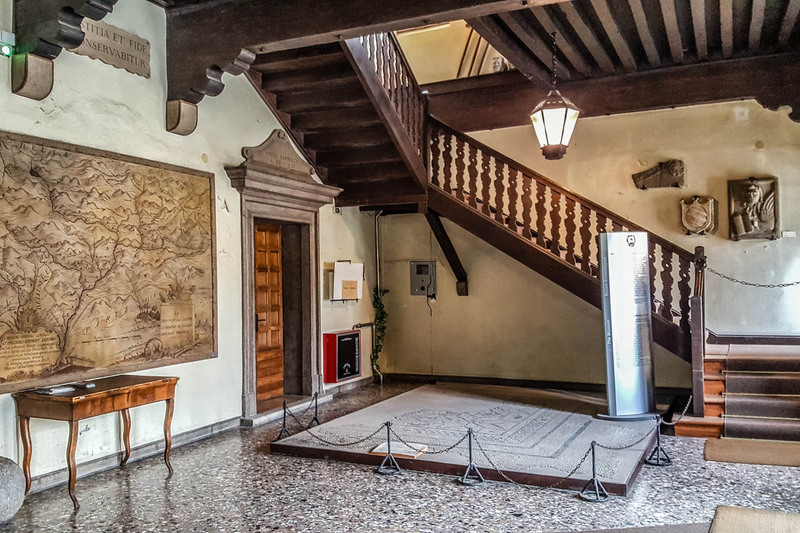 The top floor of the Historical Palace of Pieve di Cadore’ has been housing the local Archaeological Museum since the 80’s of the last century. 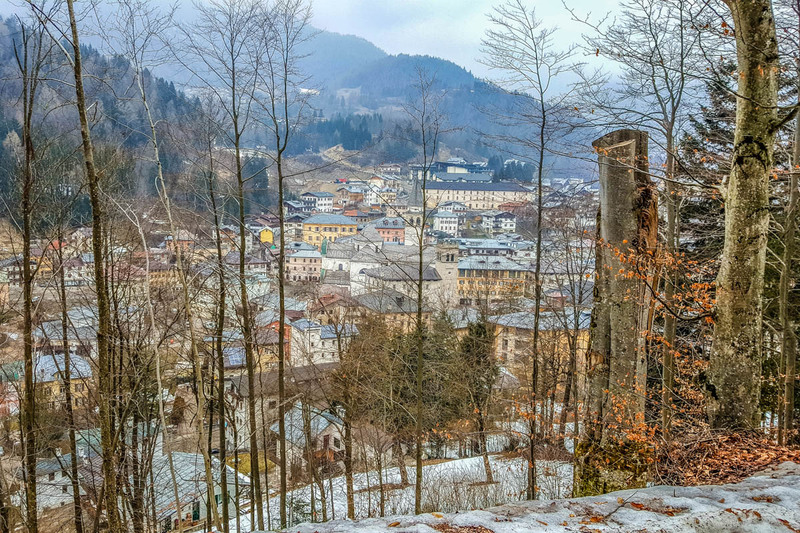 The area of Pieve di Cadore’ has been inhabited for thousands of years and vestiges of the Veneti and the Roman cultures are abundant in the region. Many archaeological excavations have been conducted there unearthing, among other things, evidence of the existence of a large cult centred around the nearby sulphuric water springs. There are also important findings with regards to the language and the writings of the Veneti. 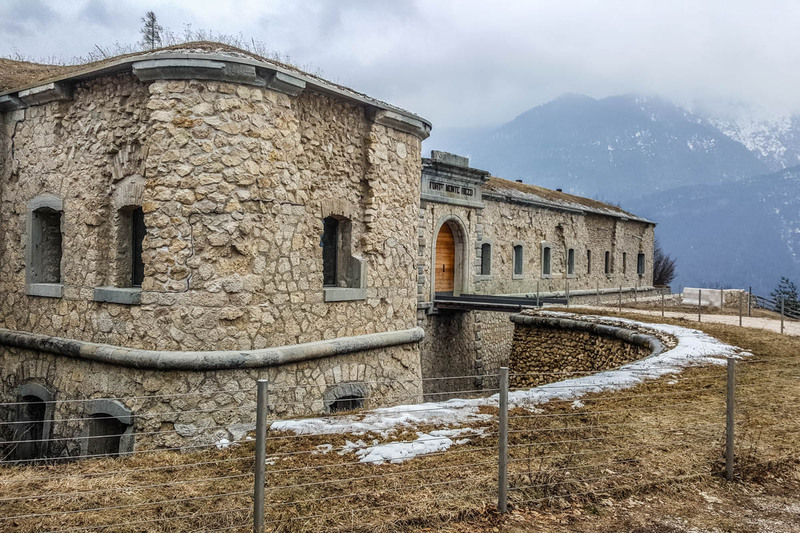 Unfortunately, during World War I, the archaeological collection of Pieve di Cadore’ was sacked and pillaged by the Austrian army and many priceless artefacts were lost forever. Excavations conducted from 1949 onwards in the area of Lagole’ (famous for its thermal waters which the Veneti considered to be sacred) and later on in other nearby places enriched significantly the museum’s collection. For further details and contact number/email, visit the official website here. 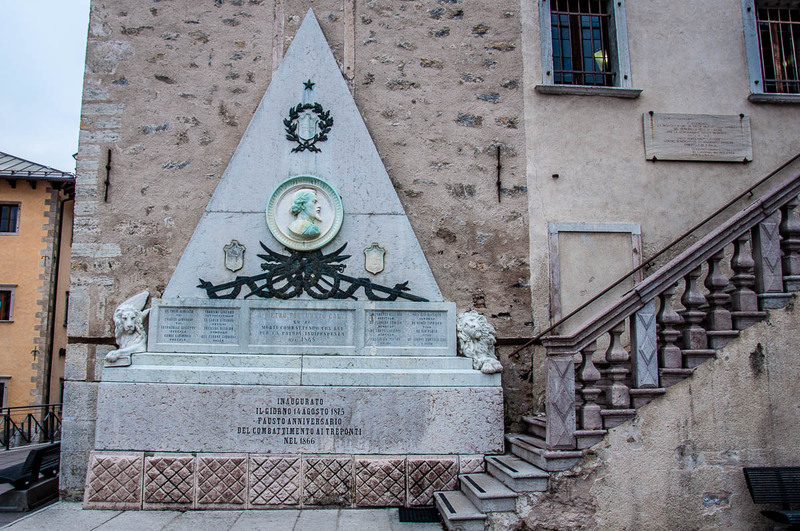 Would you believe it that there were, in fact, two men called Tiziano Vecellio in Pieve di Cadore’? They were cousins and one we know as the painter Titian while the other was a respected notary and timber merchant known as The Orator who was quite active in the town’s social and political life. 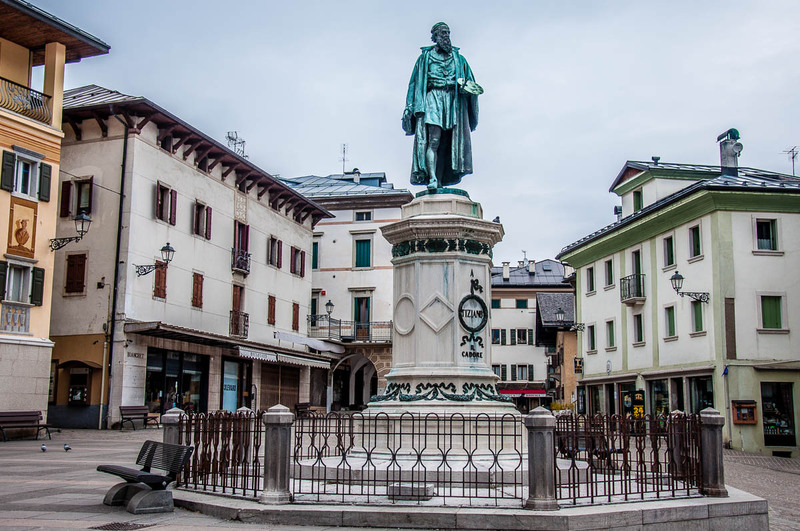 You will find the House of Titian the Orator on Piazza Tiziano – Pieve di Cadore’s beautiful main square. The house dates back to the middle of the 16th century. Nowadays it serves as the central office of the Foundation for the Study of Titian and Cadore’ (Fondazione Centro Studi Tiziano e Cadore’). Titian the Orator was quite the refined man. He had three paintings by his famous cousin – the artist Titian. Plus, his house was beautifully decorated with frescoes, fabrics, Swiss pine panels and fireplaces with majolica stoves. Unfortunately, all these things have been lost but in the study room of the house frescoes of allegories and grotesques can still be seen. Nowadays the House of Titian the Orator houses the modern and contemporary part of the Titian Library. The old part of this important repository of books, documents and other Titian-related papers and manuscripts is conserved in the Historical Palace of Pieve di Cadore’. The Foundation for the Study of Titian and Cadore’ organises different events and runs several projects the aim of which is to both study in depth and propagate the already accumulated knowledge about Titian, his artistic legacy and his birth town – Pieve di Cadore’. 1. If you want to see two or more of the above sights (namely, Titian’s Birth House, Optical and Eyewear Museum, MARC – Archaeological Museum of Pieve di Cadore’ and Monte Ricco Fort), you can buy a combined ticket at a reduced price. 2. Be aware that in winter you need to call in advance to book a visit to Titian’s Birth House. See point 1 above for details. 3. Be also aware that as Pieve di Cadore’ is a small town, riposo is religiously observed. Try to time your visit so as to avoid the long lunch break during which the above sights may close. 4. You can park at Piazza dei Martiri della Liberta’, where there is a spacious car park, and then easily walk around Pieve di Cadore’. 5. 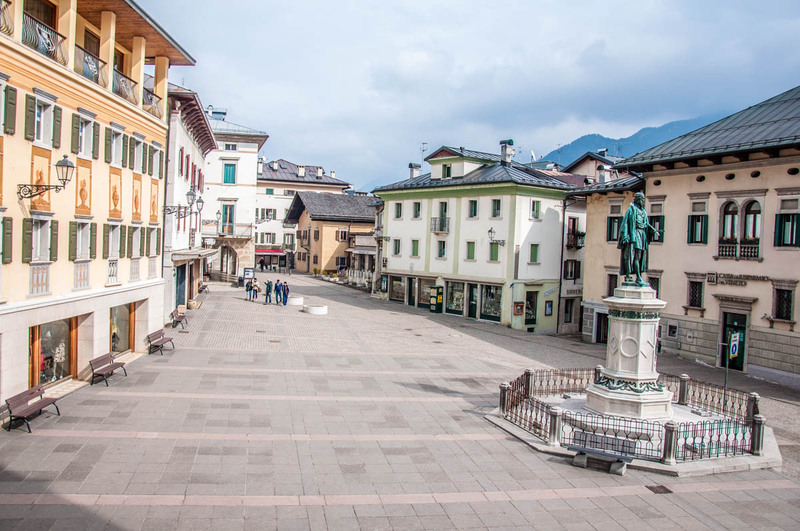 Piazza Tiziano – Pieve di Cadore’s main square – is surrounded by nice cafes and bars where you can have something to eat and drink. 6. If you are interested to learn more about Titian and the Scuola Vecelliana, you can follow a special itinerary through the Dolomites visiting a series of villages and towns where the works of the Titian’s family members have been preserved. Learn more here. If you are looking for the perfect day trip in the Veneto, combining art and nature in one, head straight over to Pieve di Cadore’ in the Dolomites. This picturesque town is famous as the birthplace of Titian – one of the greatest painters of all times. His birth house can still be visited today. Pieve di Cadore’ is also where the Italian optical industry was born. 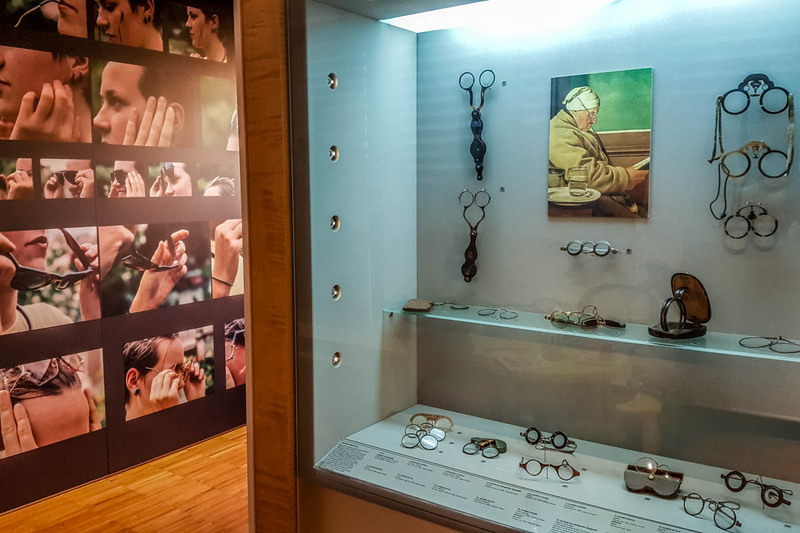 You can learn more about it and the importance that eyewear has for people by visiting the very modern Optical and Eyewear Museum in the town. For a bit of a hike, head up to the Monte Ricco Fort – a place that has served a defensive function since Pre-Roman times and nowadays is crowned by a historical fort. Pieve di Cadore’ stands only an hour and a half away from Venice and less than forty minutes away from Belluno. If you have a chance, spend half a day or a full day exploring everything this small yet very pretty town has to offer. Once you have ticked Pieve di Cadore’s sights off your list, you can head to the nearby Lagole’ – an area of natural and archaeological interest – and the stunning Lake Cadore’. Have a great time!